James N. Morgan was appointed keeper on 25 OCT 1879 and resigned 11 APR 1881. Henry Finch was appointed keeper 11 APR 1881 and transferred to Station Michigan City on 22 APR 1889. 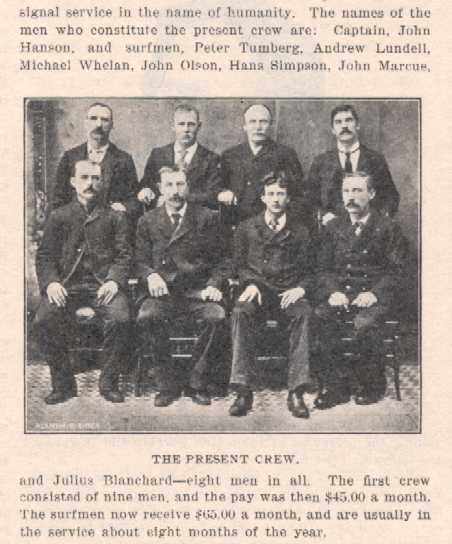 John Hanson was appointed keeper on 22 APR 1889 and was still serving in 1915. 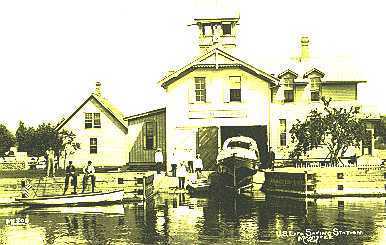 A new page in United States Coast Guard history was turned Monday, June 4, 2001, when Station Manistee was honored at an establishment ceremony. Station Manistee will now be the parent command to Stations Ludington and Frankfort as part of the Coast Guard’s reorganization plan. The three stations will oversee about 118 nautical miles of coastline and cover 2,876 square miles of operating area. The three stations will have 38 regular crew members, 21 part-time personnel and 61 auxiliary members. The stations have switched some crew members, with Ludington’s crew dropping from 16 to 9, Frankfort’s dropping from 14 to 9 and Manistee’s growing from 5 to 20. Chief Warrant Officer Tim Monck, commanding officer at Station Manistee, joked to the large crowd on hand for Monday’s ceremony that it was like “déja vu” all over again, referring to his first tour of duty at Station Manistee which began in 1994. “It would be a huge understatement to say that the station has undergone a metamorphosis since I was here the first time,” Monck said. 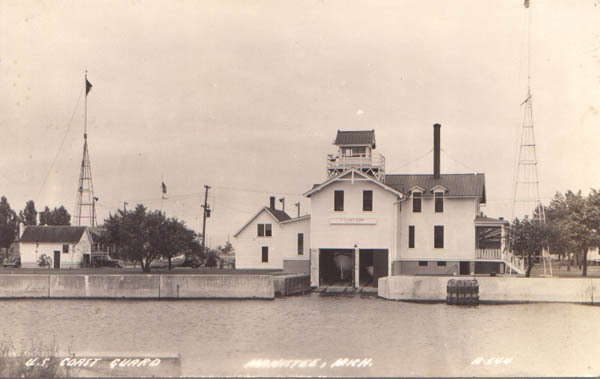 “We went from the threat of the station being closed down in 1996 to now operating as a year-around station.” Monck said the changes that have come about are driven by technology and the Coast Guard’s desire to continue to be good steward’s of the taxpayers’ money. “We need to focus on the positive,” Monck told the crowd. “Our newer boats will require less maintenance, which will allow our crews to be out on the water more and allow them to receive more training. The consolidation of management functions to the station here will also free up more personnel to be out on the water. 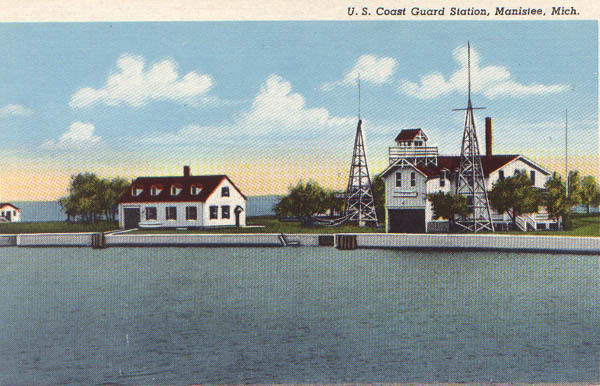 Commander Roger Dubuc, commander of Coast Guard Group Grand Haven who devised the reorganization plan, said Manistee “jumped right off the map” at him as the logical place to have the regional station. “The plan made sense to me, but then we had to be creative in our sell to those in charge in Washington, D.C.,” Dubuc told the crowd. “But after four years in the making we did.“And now today the Coast Guard passes another major milestone with a handpicked chief and crew that we feel are up the challenges in the days ahead,” he added. As part of the reorganization plan the Coast Guard will replace 17 44-foot motor life boats - like the one that was stationed at Ludington - with 13, 47-foot motor life boats. 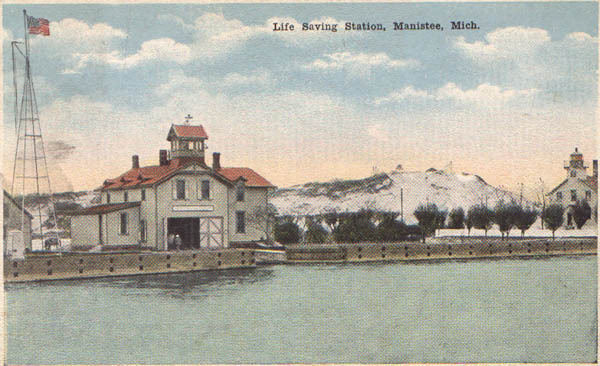 Station Manistee is scheduled to receive the 47-foot boat in July. Station Ludington is now equipped with a 21-foot rigid hull inflatable and a 30-foot Zodiac boat. Manistee will cover an area south of Ludington to north of Frankfort with the new 47-foot boat. It is a heavy weather boat, is much faster than the 44-footer and requires less crew to operate.